In Greek mythology, Elysium is a heavenly, peaceful and beautiful, place where those favoured by the gods go after they die. It's also the name of the latest release by Finnish power metal legends Stratovarius. After the tantalizing Darkest Hours EP, I looked forward to this release. The new tracks were promising (check my review on this site), and I hoped the remainder of the new album would be as good. After having played Elysium a several times, I must confess I was wrong. The remainder is even better. Writing about Stratovarius is easy since there now is a Stratovarius before and after Timo Tollki. Much has been written about the Tollki era and his departure, but it's time to leave that to the annals of history. He is no longer associated with Stratovarius and we are to judge the band by their current output, which started in 2009 with Polaris. What I like about this band is that no matter what line up appeared on whatever album, they always stuck to their task of being a progressive power metal band. There may have been faster and harder-edged albums, more progressive ones too, but musically the band's loyalty to their own style is admirable. Elysium is no exception. Stratovarius seems to return to the second half of the Nineties, considered their best era, which means a more progressive, rather melodic sound, not shy of orchestral arrangements. As to the songs, there is no reason to complain. The song writing duties fall to vocalist Timo Kotipelto Votively, keyboard legend Jens Johansson, and impressive guitarist Matias Kupianen. While Polaris was not the greatest record for song writing, Elysium shows substantial improvement. The album sounds well balanced, more mature than Polaris, and equally well produced. Speed fans beware; Elysium hosts only three fast tracks. Under Flaming Skies, The Game Never Ends and Event Horizon definitely pound away, but still have a distinct progressive touch. Three slower tracks appear as well, the orchestral Fairness Justified, Lifetime In A Moment and Move The Mountain. Darkest Hours and Infernal Maze are mid tempo and prevailed on the EP Darkest Hours. However, the title track is a completely different story. If the first eight tracks on this album are good,this final one puts the icing on the cake. Elysium is an 18-minute musical journey that, given its length, would normally kill any power metal album. However, on this work it feels very comfortable. The build up is great and the variety within the arrangement keeps your attention levels to a peak. Additionally, Elysium reveals how fantastic a guitarist Mathias Kupianen is. It also gives long time keyboardist Jens Johansson plenty of room to shine. Elysium is a glorious track that shows resemblance to the grand epics from Dream Theater. 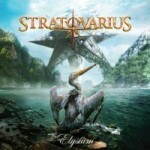 The message of Elysium is crystal clear: Stratovarius is back on track and here to stay. Even better news: in this modern day, you don't need the god's favour to enjoy Elysium. Simply get a copy of this album. I'm not sure to what extent it's peaceful, but Elysium is beautiful. The message of Elysium is crystal clear: Stratovarius is back on track and here to stay. Even better news: in this modern day, you don't need the god's favour to enjoy Elysium. Simply get a copy of this album.